Cardio will help you see the results of strength training as it will help you burn fat you may be storing around your midsection. There are two types of cardiovascular exercises, low- and high-intensity. Low-intensity, low-impact cardio workouts typically last 45 minutes to an hour and help you burn fat. This includes exercises such as swimming and walking when completed at brisk, sustainable pace. High-intensity cardio workouts involve interval training, meaning you incorporate short bursts of increased speed or intensity. High-intensity workouts increase your metabolic burn rate as well as keep you pumped most of the day. You should do high-intensity cardio exercise between 20 minutes to 30 minutes each day. The top high-intensity workouts include step aerobics, bicycling, and running. Real Women's Fitness describes Kickboxing as the perfect lower abdominal cardiovascular workout. Kickboxing targets the lower abdominals for a killer workout because of the types of kicking involved (such as round house kicks, which involve movement from your hip to the top of your foot). The speed involved in kickboxing helps to really work your lower abs back into gear, combining fat-burning with strength training. Reverse curls are the most popular lower abdominal exercise. Basically lay flat on your back and place your hand under your lower back. Straighten out your legs. Keeping your back on the floor, tense your abs. Curl your knees up to your chest. When you think can't bring them any closer rock back on your hand to bring them in further while you tighten your abs more. Slowly lower your legs (for an extra challenge without relaxing your abdominal muscles). Repeat up to 20 repetitions. Dr. Charles reminds exercise buffs that the key to the reverse crunch is lifting your pelvis off the floor. For an extra challenge, try doing these on a decline by laying down on equipment with your feet pointed to the floor and your arms overhead. The hanging knee raise works your entire abdominal section. While doing a chinup, straighten out your entire body. Breathe in and tense your abs and bring your knees in toward your chest. 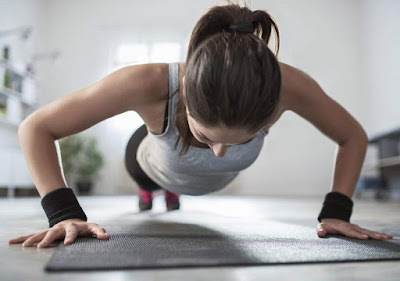 When you are at the top of the motion Real Women's Fitness recommends rocking your pelvis to give a "final crunch" by slamming your knees towards your chest. Fitness experts, personal trainers and health care professionals recommend a balanced diet when exercising. Ultimately, you will see little change in body shape if you continue the poor nutrition habits that caused a flabby belly to begin with. The American Heart Association recommends exercising at least 30 minutes each day. Doing so decreases your risk of developing coronary artery disease. Mix slow and steady cardio with high-intensity cardio routines. Even when walking or swimming, incorporate intervals of short bursts of increased speed. This will increase your burn rate but make the exercise continue to work after you finish.